Please remember to view the full information about MCAT in our PDF profile. There you will find additional information about scoring, test fees and registration, how to prepare, and where to find more information. You can also save or print a copy for your records. The Medical College Admission Test (MCAT) is a standardized examination for prospective medical students in the United States. MCAT is not offered in Myanmar, but is available in Thailand. It is designed to assess problem solving, critical thinking, reading comprehension, and writing skills in addition to knowledge of scientific concepts and principles and to assist admission committees in predicting which of their applicants will perform adequately in the medical school curriculum. Prior to August 19, 2006, the exam was taken entirely on paper with the option of taking a computer-based version at select testing sites beginning in the fall of 2005. Since January 27, 2007, all administrations of the exam are computer-based. 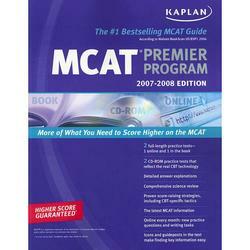 Nearly all medical schools suggest that you take the MCAT in the spring of the year you apply. The test was formerly administered twice a year, in April and August. Since January 2007, the exam is offered 22 times per year on 19 different testing dates. The exam was shortened to 5 hours and 24 minutes, which allows the test to be offered either in the morning or in the afternoon. Some test dates have both morning and afternoon administrations. The Verbal Reasoning, Physical Sciences, and Biological Sciences sections are in multiple-choice format. The Writing sample consists of two short essays that are typed onto the computer. The passages and questions are predetermined, and thus do not change in difficulty depending on the performance of the test taker (unlike, for example, the Graduate Record Examination). The science sections (PS and BS) test analytical and logical cognitive abilities. The Verbal Reasoning section was implemented to test understanding of various subtleties involved in human communication and understanding. The Biological Sciences section most directly correlates to success on the USMLE Step 1 exam, with a correlation coefficient of .553 vs .491 for Physical Sciences and .397 for Verbal Reasoning. Predictably, MCAT composite scores also correlate with USMLE Step 1 success.